Holster Girl are proud to stock the famous Safariland 6360 Level 3 Retention ALS Duty Holster, Mid-Ride, Black, STX, Colt 1911. With so many available today, it is wise to have a make you can trust. The Safariland 6360 Level 3 Retention ALS Duty Holster, Mid-Ride, Black, STX, Colt 1911 is certainly that and will be a superb acquisition. For this great price, the Safariland 6360 Level 3 Retention ALS Duty Holster, Mid-Ride, Black, STX, Colt 1911 comes widely recommended and is a popular choice with most people. Safariland have added some great touches and this equals good value for money. Safariland's model 6360 is a distinctive design that features their Automatic Locking System (ALS). Model 6280 is the base for this holster design as it utilizes the unique SLS rotating hood design for a smoother single motion draw and greater protection against attempted weapon takeaways. The 6360 is classified as a Level III Retention holster with the SLS as the primary security system; it also includes an internal locking device that retains the weapon in all directions when the primary device is open. This holster's design offers three distinct design differences from previous models. First, once the weapon is holstered, it "locks" it into place, providing an extra measure of security from standard Level II retention holsters. Second, the holsteris completely operable with the thumb, makingit very instinctive to use.. Finally, once the retetion devices are released, the weapon can be drawn straight out of the holster with no twisting or other motion required. The 6360 features a tensioning devce, molded sight track and SafariSuede lining to protect the gun 's sights and finish. Its wraparound construction and SafariLaminate Structure provide the strongest design combination available. 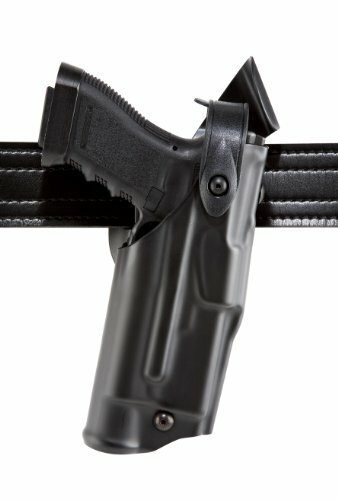 The rigid UBL (Universal belt Loop) anchors the holster and stabilizes it on your belt with hardened aerospace fasteners. Fits: Colt Gov’t 1911, Kimber 5"